Quality eyecare and personal attention are our focus at Copperfield Vision. We are a family optometry practice that prides itself on the individual care and attention we provide all of our patients. 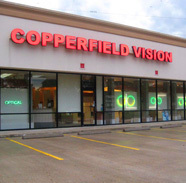 Your entire family is welcome at Copperfield Vision. We are located on Highway 6 North, 1 mile south of Highway 290, between Longenbaugh and West Road. ​We carry both affordable and high-end frames such as Marchon, Flexon, Maui Jim Sunglasses, Ray Ban Sunglasses, Vera Wang, Banana Republic, Carmen Marc Valvo, Bebe, Liz Claiborne, Kate Spade, Nike, Laura Ashley, and many more!